A sunny morning of visible migration produced good numbers of passerines streaming south off Twingness and Stromness Point. 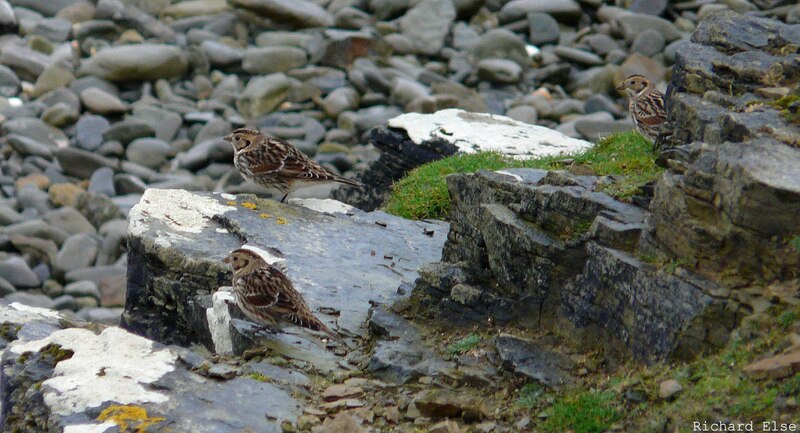 Counts of the most numerous species came to 690 Redwings, 278 Meadow Pipits and 114 Skylarks, most of which continued straight on towards Sanday and the other Orkney Islands. The year's first 2 Richard's Pipits also passed overhead, along with 6 Crossbills, a Sand Martin, 15 Swallows, a House Martin and 10 Woodpigeons. The rarest bird of the day was a Red-throated Pipit that was flushed from the crop field at Lurand, promptly vanishing never to be seen again. Another new species for the year was a Hawfinch at Holland House, while a new Buff-breasted Sandpiper on Tor Ness was (at least) the third one of the autumn. Other migrants included a Stonechat, the first 4 Bramblings of the autumn, 10 Chaffinches and 3 Siskins. Counts of other landbirds came to 5 Yellow-browed Warblers, 11 Blackcaps, 3 Chiffchaffs, 1 Willow Warbler, 1 Spotted Flycatcher, 1 Tree Pipit, 3 Robins, 1 Whinchat, 6 Song Thrushes and 14 Lapland Buntings. Again, the highlights consisted mostly of rarities that had been present for a few days: the Pallid Harrier was still hunting around the middle of the island, the Buff-breasted Sandpiper had moved to the golf course, the Pectoral Sandpiper was at Kirbest Mire and the Short-toed Lark was at Bewan. There was little change in passerine numbers, but a Barred Warbler, 3 Yellow-browed Warblers, a Pied Flycatcher, a Chaffinch, a Siskin and a Redpoll were all seen, and the first 2 House Martins for a while roosted at the observatory. Although fresh migrants were few, a nice line-up of lingering rarities comprised the Pallid Harrier, a Buff-bellied Pipit, a Citrine Wagtail, the Short-toed Lark, the Buff-breasted Sandpiper and the Pectoral Sandpiper. Other long-staying birds included a Curlew Sandpiper, a Barred Warbler and 2 Yellow-browed Warblers. The best of the new arrivals were a Collared Dove, a Spotted Flycatcher, a Pied Flycatcher and a Siskin. It seemed to be a long time in coming, but the influx of Pallid Harriers into Britain finally reached North Ronaldsay, with an eagerly awaited juvenile bird quartering the east side of the island all day. This is a new species for the island, and species number 202 on the year-list - a list that now includes an impressive 13 different raptors! 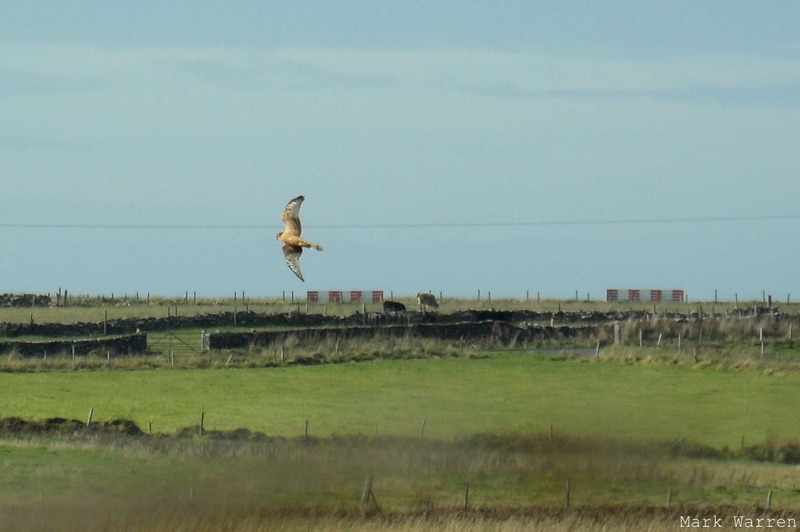 Such was the excitement of the harrier, and the ensuing high speed pursuit all over the island, that we never really got round to checking if any of the long-staying rarities were still around. A Pectoral Sandpiper deep in the morasses of Hooking Loch was perhaps the bird from 6 days previously, although it has not been seen in the interim. The Curlew Sandpiper and a Grey Plover were still around, while the day's common raptors were 2 Hen Harriers, a Merlin and a Kestrel. There were few new passerines, although an unringed Yellow-browed Warbler was seen in Holland garden. A Barred Warbler was also still in the gardens, and counts of other songbirds came to 5 Whinchats, 2 Robins, 1 Song Thrush, 1 Lesser Whitethroat, 13 Blackcaps, a ringed Yellow-browed Warbler, 3 Willow Warblers, 1 Chiffchaff, 5 Goldcrests, 19 Lapland Buntings and a Redpoll. After a brief hiatus, the daily rarities resumed. A brace of new Nearctic waders were the day's highlights - not an entirely unexpected event after recent weather systems across the Atlantic. 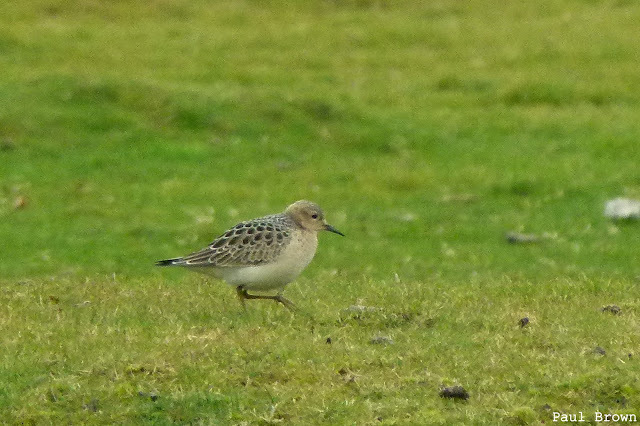 Firstly, our second Buff-breasted Sandpiper of the year dropped into the current rarity hotspot at Bewan Loch in the morning, spending a while in the company of its compatriot BUFF-BELLIED PIPIT and a Citrine Wagtail before relocating to the west coast of the island. 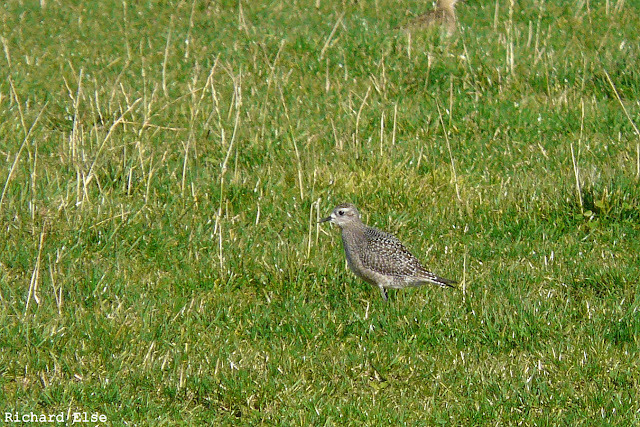 A short time later, a juvenile American Golden Plover - a new species for the rapidly advancing year-list - joined one of the large flocks of its European counterparts near Gretchen Loch. 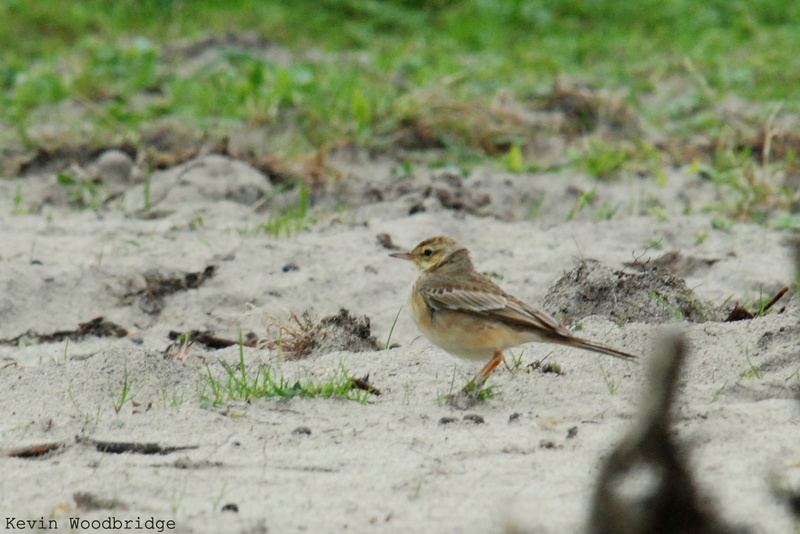 The other Citrine Wagtail was also still present in the southern half of the island, and the other BUFF-BELLIED PIPIT had opted for a change of scenery at Bridesness Point. A new Barred Warbler was ringed at Holland House, where 3 Yellow-browed Warblers all bore rings from earlier in the week. At least 1 Common Rosefinch was seen, and other passerines included the first Chaffinch of the autumn, 3 Robins, 5 Whinchats, 4 Song Thrushes, a Lesser Whitethroat, a Garden Warbler, 14 Blackcaps, 34 Lapland Buntings and 60 Snow Buntings. The Curlew Sandpiper and a Grey Plover were still around, and the day's selection of raptors comprised 2 Hen Harriers, 2 Merlins, 2 Peregrines and a Kestrel. A Merlin was a surprise highlight of the evening's mist-netting session. 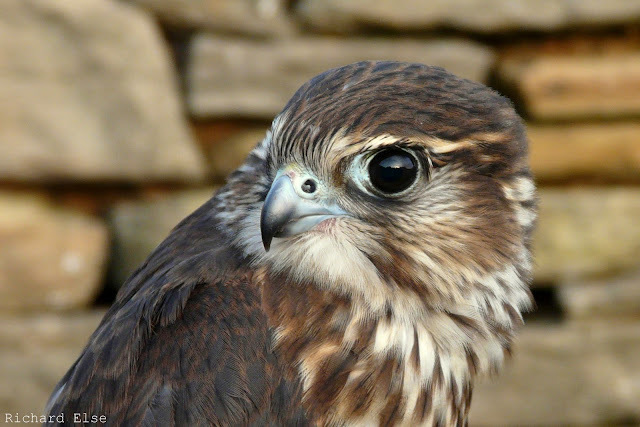 Given the numbers of transatlantic vagrants currently appearing on European coasts, it is prudent to check any Merlins for the American subspecies. 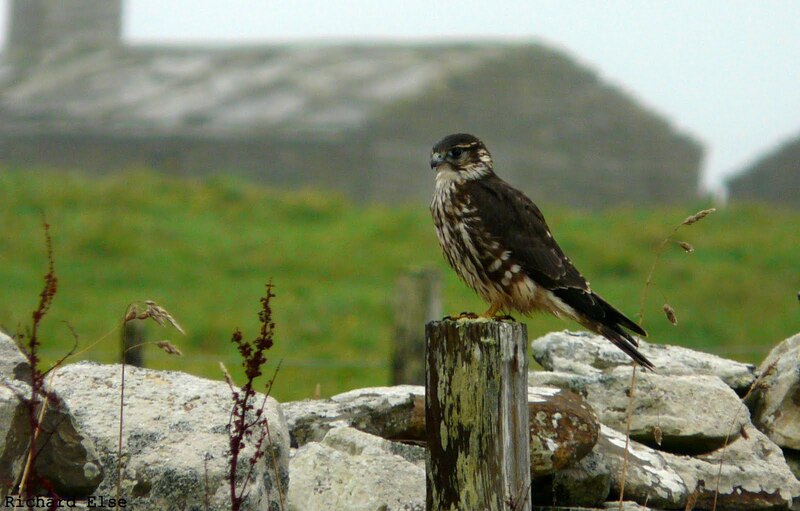 The bird featured on this blog on the 13th of September showed some interesting features, but appears to be just a dark European Merlin, possibly of the Icelandic form. Today's bird is a straightforward European one, with too many pale tail bars to arouse hopes of a Nearctic vagrant; but it was nice to study it up close all the same. With such a run of good birds in the preceding week, it felt slightly disappointing to go an entire day without finding a single new rarity; but we could hardly complain when we still had 2 BUFF-BELLIED PIPITS, 2 Citrine Wagtails and a Short-toed Lark to enjoy. There were still plenty of the more routine migrants around too, including a Barred Warbler, 3 Yellow-browed Warblers, a Lesser Whitethroat, 2 Garden Warblers, 16 Blackcaps, 2 Chiffchaffs, 3 Willow Warblers, 4 Goldcrests, 3 Robins, 2 Whinchats, 3 Song Thrushes, a Redpoll and 30 Lapland Buntings. A Curlew Sandpiper and 2 Grey Plovers were the only noteworthy waders. A movement of wildfowl involved a couple of Whooper Swans and 418 Pink-footed Geese. There was no sign of the Lesser Kestrel, but our little purple patch of good birds continued to provide its daily dose of excitement. 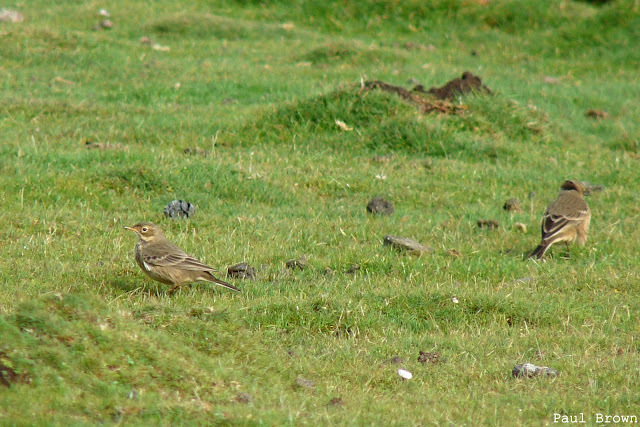 The birding tour group staying at the observatory, having already enjoyed an amazing run of rarities, managed to go one better than their Short-toed Lark when they found a superb BUFF-BELLIED PIPIT in exactly the same place. Incredibly, while we were watching the pipit, a second bird walked into view alongside the original one! 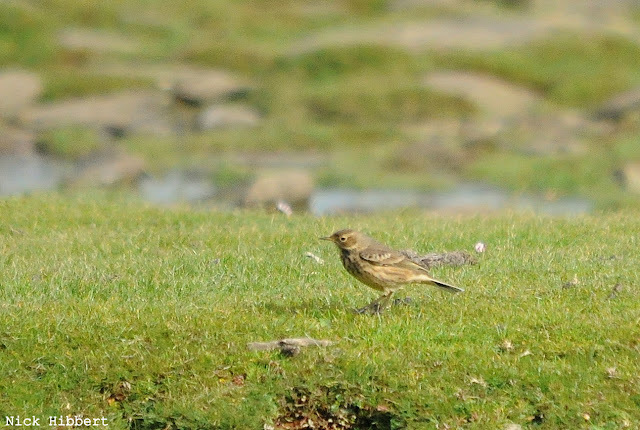 The 2 Buff-bellied Pipits were quite different in appearance, the original bird (lower picture) having distinctly warmer plumage tones. 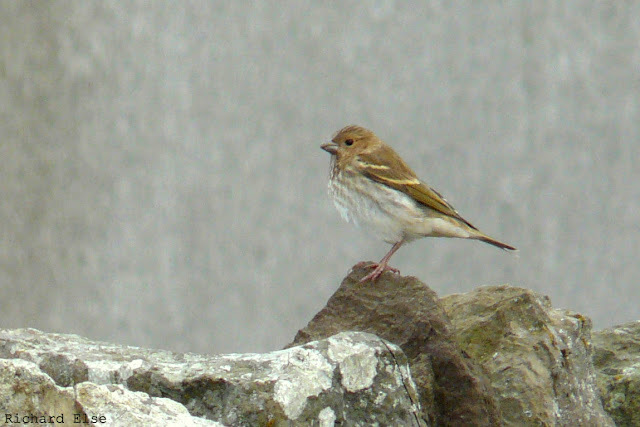 The only previous record of this American vagrant on North Ronaldsay was in October 2008. Both Citrine Wagtails, though overshadowed by mega rarities for the last few days, were still present and continuing to show well at times. A Barred Warbler, 3 Yellow-browed Warblers and a Common Rosefinch provided the supporting cast of scarce passerines, while common migrants included a Common Redstart, 5 Whinchats, 3 Song Thrushes, a Reed Warbler, a Lesser Whitethroat, a Garden Warbler, 9 Blackcaps, a Chiffchaff, 4 Willow Warblers, a Goldcrest and 17 Lapland Buntings. A movement of Pink-footed Geese included overhead flocks of 74 and 8 birds and at least 3 Grey Plovers, 3 (Common!) 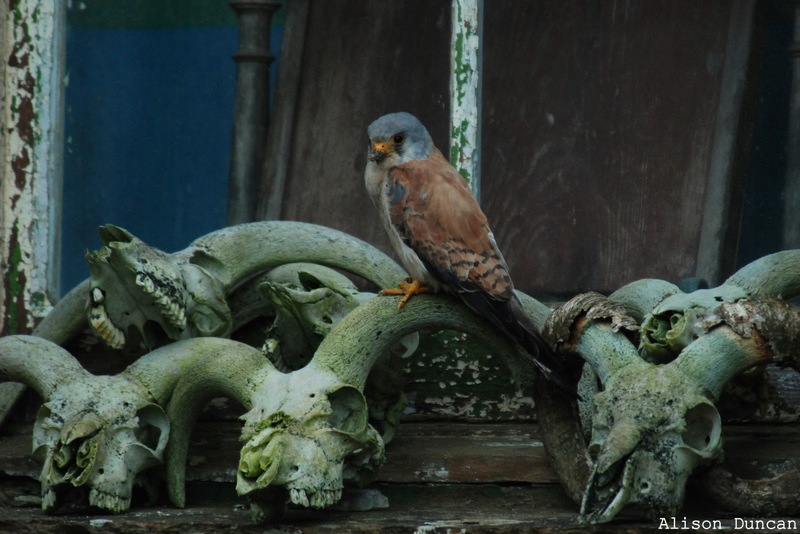 Kestrels and 3 Merlins were on the island. The LESSER KESTREL was located at Holland House, where it remained for most of the day, sheltering from the strong wind on the leeward walls of the building. 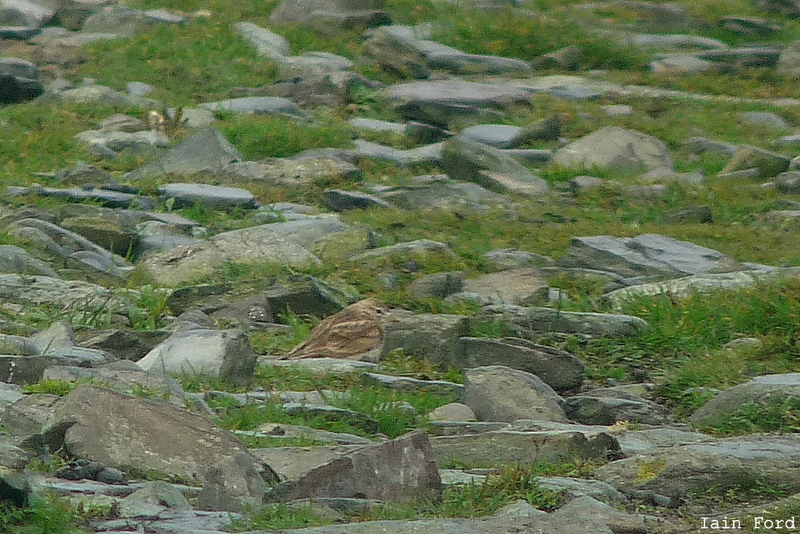 The best new bird was a flighty Short-toed Lark near Bewan Loch, while the previous week's Ortolan Bunting reappeared on the north coast. At least 2 Common Rosefinches, a Barred Warbler and 2 Yellow-browed Warblers were still present, and counts of other passerines included 8 Willow Warblers, 3 Goldcrests, 7 Blackcaps, 1 Garden Warbler, 1 Pied Flycatcher, 1 Robin, 2 Whinchats, 2 Song Thrushes and 12 Lapland Buntings. 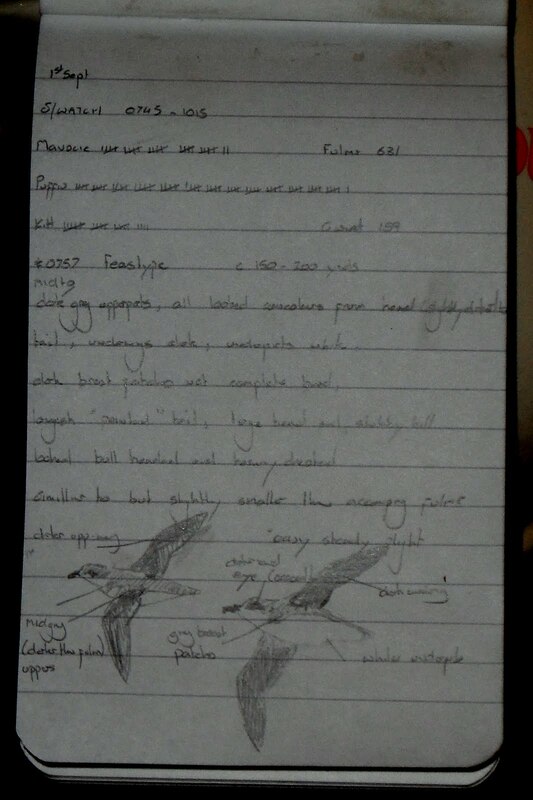 A Curlew Sandpiper on the golf course was new, and the Slavonian Grebe and Hen Harrier remained from earlier days. 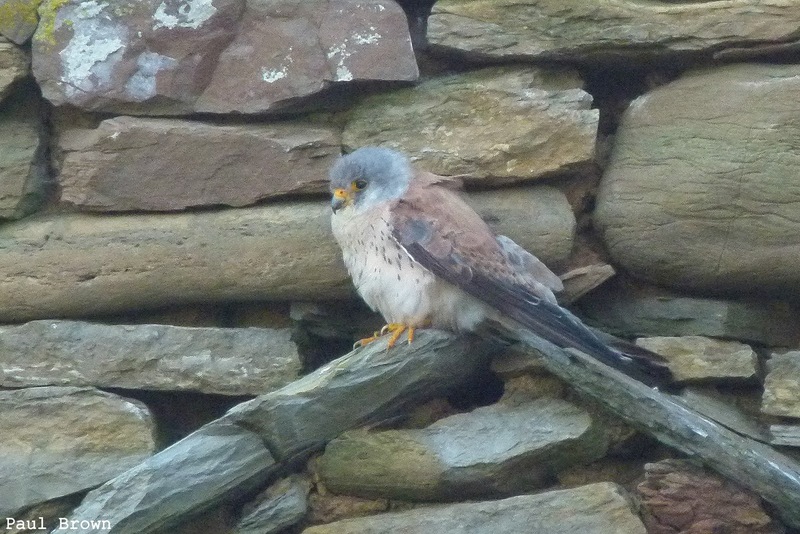 The main story of a memorable day began with a sighting of an unusual kestrel flying down the main road. It had a bright blue head; its underparts looked pale and quite plain; it ate insects on the wing: the alarm bells were ringing and demanding further investigation. 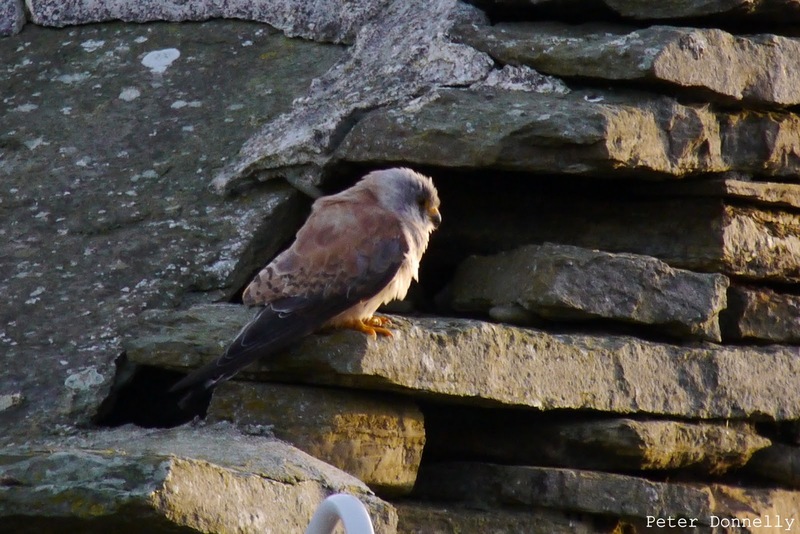 Further flight views were puzzling and inconclusive, but it was eventually found obligingly posed in full view on a wall at Kirbest, its white toenails glinting in the evening sunlight: identification confirmed - we were watching Orkney's first LESSER KESTREL! The long-staying Citrine Wagtail spent the day in its usual haunts at Kirbest and Bridesness, and another, at least our third of the autumn, was found near Bewan. This wagtail was a lot less flighty than the previous birds and gave excellent views in the morning. A juvenile Red-backed Shrike at Quoy Banks was another good bird, while other passerine migrants included a Barred Warbler, a Yellow-browed Warbler, 17 Blackcaps, 2 Garden Warblers, 2 Lesser Whitethroats, 6 Willow Warblers, a Chiffchaff, a Goldcrest, a Spotted Flycatcher, a Common Redpoll, 19 Lapland Buntings, 3 Whinchats and 3 Robins. The Hen Harrier, 2 Common Kestrels, a Merlin and a Grey Plover were all still present; an arrival of Grey Herons brought the log count to 14; and the Slavonian Grebe remained on Ancum Loch. With many migrants still present all over the island, it was nice to have a glorious, sunny morning in which to enjoy them. 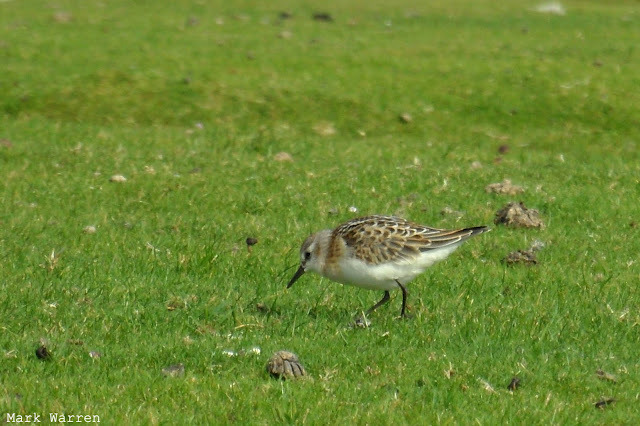 The day's headline bird was the first Pectoral Sandpiper of the year on Hooking Loch, but the main focus was on the various passerines that were buzzing around the gardens and field edges in the sunshine. With a count of 37, Blackcaps remained the most numerous of the small migrants, most of which were at Holland House and the central part of the island. Numbers of other warblers came to 2 Barred Warblers (1 new and 1 long-stayer), 2 Lesser Whitethroats, 3 Garden Warblers, 2 Sedge Warblers, 6 Chiffchaffs, 15 Willow Warblers, 1 Goldcrest and 6 Yellow-browed Warblers. Other small migrants included the lingering Citrine Wagtail, 5 Common Rosefinches, a Common Redpoll, 2 Pied Flycatchers, 2 Spotted Flycatchers, 7 Song Thrushes, 7 Whinchats, 3 Robins and a Tree Pipit. The Slavonian Grebe and the Scaup were still on Ancum Loch, a Grey Plover was seen and a Hen Harrier and a Peregrine were the raptor highlights. It has been a good autumn so far for Grotfinches, with sightings of up to 5 on most days this month. However many individuals have been involved, all have been brown juvenile-type birds. A Tawny Pipit was found near Kirbest in the morning. This is only the second record of the species for the island, following one in late June last year, and only about the fifth for Orkney. 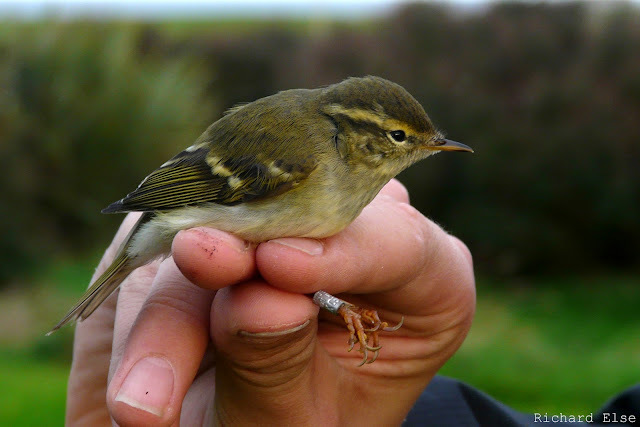 Another highlight of the day was the year's first Yellow-browed Warbler at Holland House. At this time of year, when the wind is blowing hard from the east and it rains all day, you can expect to find small migrants taking shelter along the western, leeward, side of North Ronaldsay; and with just such weather conditions setting in, it was no surprise to find the majority of new birds, impluvious and seeking respite from the gales, concentrated along the island's less exposed coast. Small numbers of migrants seemed to be arriving all day, but counts of common species came to at least 16 Blackcaps, 6 Garden Warblers, 14 Willow Warblers, 2 Chiffchaffs, 5 Whinchats, 4 Robins, 1 Pied Flycatcher, 1 Spotted Flycatcher, 1 Tree Pipit and the first 5 Song Thrushes of the autumn. 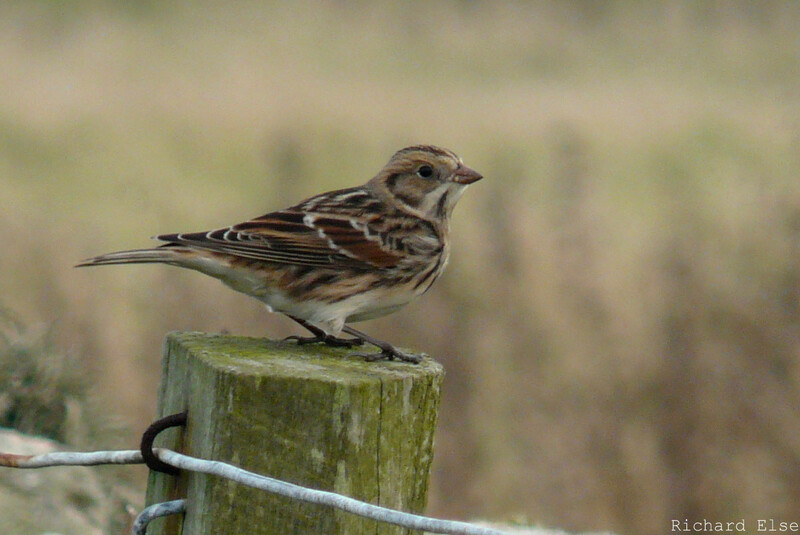 The Citrine Wagtail and 2 Barred Warblers were still around, and 4 Common Rosefinches were seen. The non-passerine highlights were 2 Short-eared Owls, a Little Stint, a Grey Plover and the Scaup. Both land and sea vied for attention as a stiff south-easterly breeze brought a few small migrants to the island and simultaneously opened the floodgates for large numbers of seabirds to exit the North Sea past Dennis Head. The highlights of the best day's seawatching of the year so far were a Great Shearwater, the second Balearic Shearwater of the year, 2 adult Pomarine Skuas and the honorary seabird of the day: a Short-eared Owl. Good numbers of commoner species included 435 Sooty Shearwaters, 135 Manx Shearwaters, 1902 Fulmars (including 3 blue phase birds), 261 Kittiwakes, 9 Great Skuas and 4 Arctic Skuas. Back on the land, an Ortolan Bunting found at Senness in the evening was the best new arrival and an addition to the year-list. 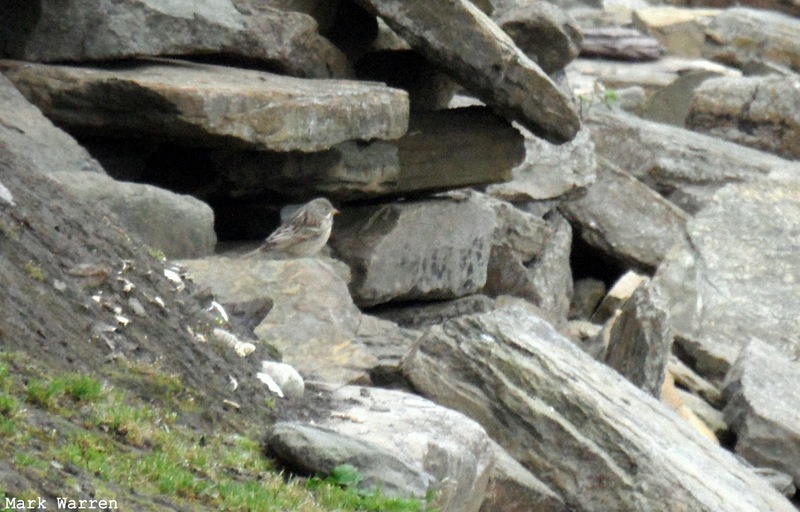 The elusive Citrine Wagtail put in another brief appearance in the morning, 2 Barred Warblers (one of which was probably new) were seen and a Common Rosefinch was at Holland House. Counts of other small migrants came to 4 Willow Warblers, 3 Lesser Whitethroats, 2 Common Whitethroats, 2 Blackcaps, 1 Garden Warbler, 1 Robin, 16 Lapland Buntings and 35 Snow Buntings. New migrants, still rather few and far between, nevertheless included an eclectic hat-trick of species that were new for the autumn: an adult Slavonian Grebe on Ancum Loch was a bit of a surprise, a Short-eared Owl gave fantastic views nearby, and a Jack Snipe lurking in the irises at Kirbest narrowly missed our mist nets. The selection of passerine migrants was similar to previous days, with census counts coming to 3 Common Rosefinches, 2 Barred Warblers, a Lesser Whitethroat, 11 Blackcaps, 2 Garden Warblers, 5 Willow Warblers, 2 Chiffchaffs, 17 Lapland Buntings and a Snow Bunting. 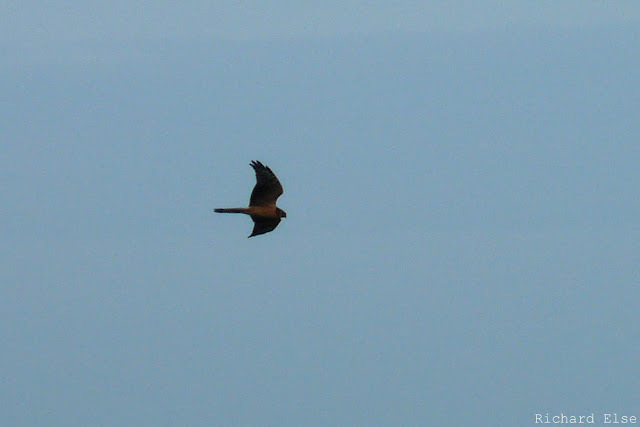 Other sightings included the Scaup, a Grey Plover, 2 Merlins and a Kestrel. A small arrival of migrants that appeared unexpectedly in the late morning included the first Red-backed Shrike, and Spotted Flycatcher of the autumn, 3 Barred Warblers, a Lesser Whitethroat, 2 Common Whitethroats, 8 Blackcaps, 2 Chiffchaffs, 6 Willow Warblers and a Common Redstart. A Common Rosefinch and a Barred Warbler were at Holland House again and the Siskin and the Robin were still present. 13 Sooty Shearwaters passed the seawatching hide, while 2 Lapland Buntings and 6 Snow Buntings were on the shore nearby. Although a reasonable variety of migrants was on the land, the bird of the day came in the shape of a Balearic Shearwater from the seawatching hide: this is still a very uncommon species in Orkney and less than annual from North Ronaldsay. A Barred Warbler trapped at Holland House in the morning was probably a new migrant, but 3 Common Rosefinches were presumably the birds from earlier in the week. A Reed Warbler, 2 Whitethroats, 6 Blackcaps, a Robin, a Siskin and a Common Redpoll were new migrants; other passerines included 13 Lapland Bntings, 3 Snow Buntings, a Chiffchaff, 3 Willow Warblers and a Whinchat. 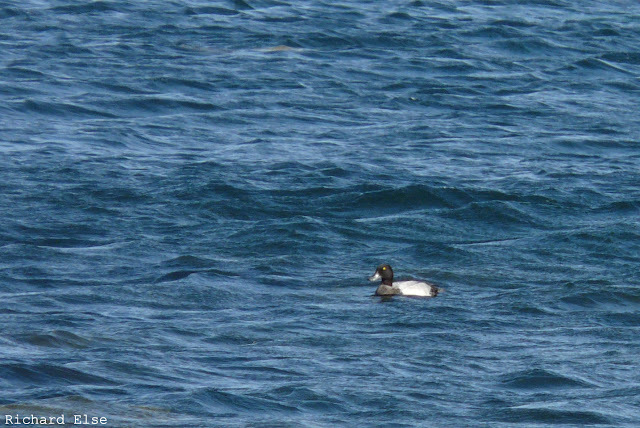 A drake Scaup was on Hooking Loch, and the 8 Pink-footed Geese were still present. A blue phase Fulmar passed by among 200 ordinary Fulmars, 4 Sooty Shearwaters and 7 Manx Shearwaters. At least 5 Kestrels were still around, while the wader highlight was a Little Stint on the golf course. A few Merlins have passed through during the last few days of good raptor passage. 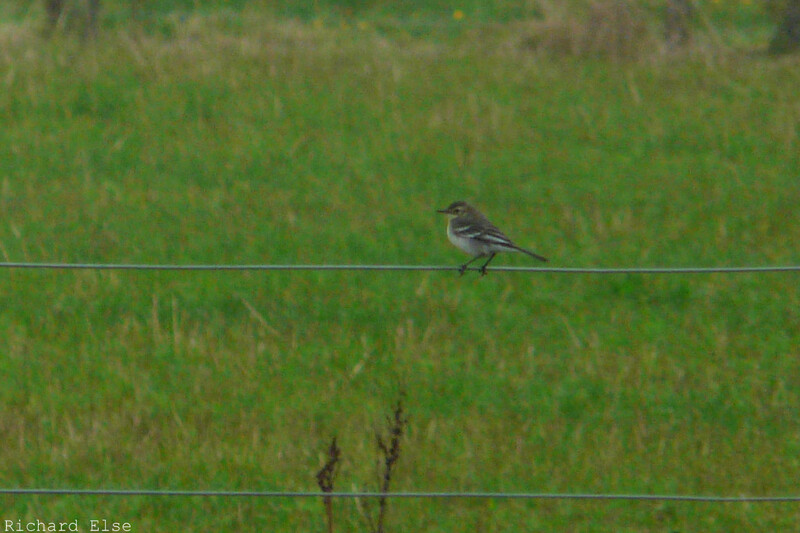 A further sparse scattering of migrants appeared in a day dominated by rain and fog. The highlight was a frustratingly mobile Citrine Wagtail that made a couple of fleeting appearances at Kirbest in the afternoon, soon hightailing away into the fog towards Bridesness on both occasions. 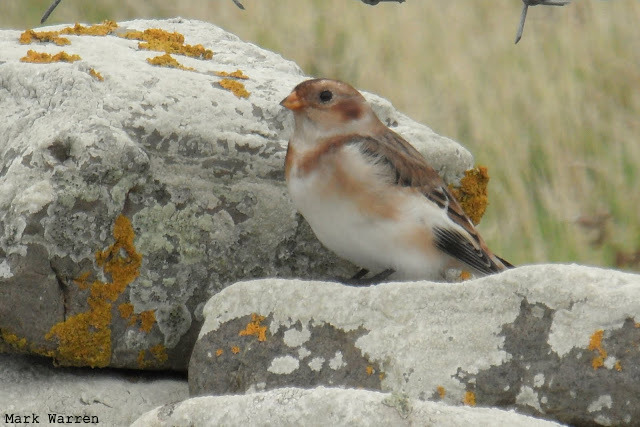 Other new passerines on the island included 2 Garden Warblers, a Blackcap, a Chiffchaff, 2 Willow Warblers, a Goldcrest and a Snow Bunting; 6 Lapland Buntings had probably arrived earlier in the week. A flock of 8 Pink-footed Geese were the first of the autumn, and it was another good day for raptors: at least 5 Kestrels were seen again, as well as 2 Merlins and 2 Sparrowhawks. Waders included a new Little Stint at Bridesness, 2 Grey Plovers, 2 Whimbrels and a Common Sandpiper. 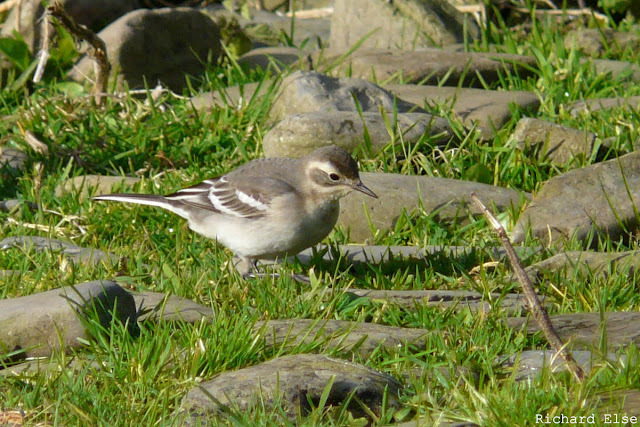 This is the third Citrine Wagtail sighting this month, and it is not clear how many different birds have been involved. We think that this individual has a noticeably darker and less clean appearance than the birds seen on the 2nd and 7th, and is probably a new bird. A welcome return to relatively clement weather gave us an opportunity to find any birds that had gone undetected during the previous day's deluge, as well as any new arrivals that had come in overnight. The first Corncrake of the autumn at Ancum Loch was the highlight, although a drake Scaup sitting on the sea near Westness was a bit more of a surprise. A group of 3 Common Rosefinches at Lurand were a promising start to the day, and nearly 300 Meadow Pipits were counted, but other new passerines were rather thin on the ground: a Pied Flycatcher, a Blackcap, a Sedge Warbler and a Whinchat were the best we could come up with, although at least some of the 28 Lapland Buntings that were logged would also have been fresh arrivals. Small birds remaining from earlier in the week included the Barred Warbler, a Whitethroat, 2 Willow Warblers, a Whinchat and a House Martin. There was a noticeable increase in raptor activity, with a Peregrine, 2 Merlins and at least 5 Kestrels on the island during the morning. New waders included 2 Grey Plovers, a Little Stint and 2 Common Sandpipers; those that had been seen in previous days included the Wood Sandpiper and at least 33 Ruffs. Scaup is quite a scarce duck on North Ronaldsay, but this is the third record of the year so far. Torrential rain, fog and wind were the bringers of difficult birding, but, when they're coming from the east, these are the type of conditions that can result in migrants arriving and taking refuge on the island. On this occasion no sizeable fall materialised, although a small number of new birds found in the afternoon included one each of Tree Pipit, Common Redstart, Reed Warbler, Lesser Whitethroat, Common Whitethroat, Garden Warbler and Blackcap. Another Common Redstart, a Willow Warbler, 12 Lapland Buntings and a House Martin all remained from earlier days. When the mist cleared for a few brief minutes, 12 Sooty Shearwaters were seen from the north end of the island, raising the question of just how many seabirds had been passing unseen behind the veil of fog. 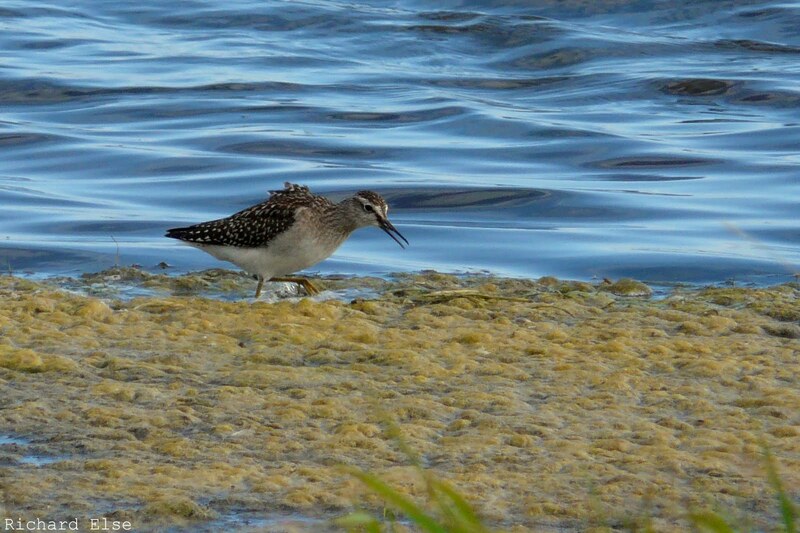 A Greenshank was the only notable new wader, while the Wood Sandpiper stayed faithful to its usual spot at Gretchen Loch. An early vigil from the seawatching hide, hoping that the impressive number of seabirds that have been passing the south and west coasts of Britain might have finally made their way around to North Ronaldsay, eventually produced a Great Shearwater, but numbers of the commoner species were fairly average: 533 Fulmars, 47 Sooty Shearwaters and 18 Manx Shearwaters passed by. On land, the first Snow Bunting of the autumn was the highlight, while the Lapland Bunting count increased to 28. A Reed Warbler was discovered at Ancum Loch, while a new Willow Warbler and the remaining Barred Warbler were also logged. A few new arrivals made it here through the breezy westerly weather, including a small influx of Lapland Buntings, taking the number on the island to at least 11: harbingers, perhaps, of the previous autumn's spectacular incursion repeated. The first Grey Wagtail since April toured the island throughout the day, and the first Grey Plover for almost as long was also seen. Other new birds included 3 Peregrines, a Swift and 2 Willow Warblers, while a count of 101 Wheatears also involved some new migrants. Few seabirds of interest were seen, but, terns having been in short supply for a while, a Sandwich Tern, a Common Tern and 4 Arctic Terns were noteworthy. Lingering highlights included the Barred Warbler, the Wood Sandpiper and 2 Little Stints. A Citrine Wagtail seen in the morning was likely to be the same one as the previous week's sighting, and, just like that day, it quickly disappeared high into the sky and was not seen again. New passerines included a Barred Warbler, a Common Whitethroat, a Lesser Redpoll and a House Martin; those thought to be lingerers from earlier days included a Common Redstart, 2 Whinchats and a Willow Warbler. A couple of Little Stints on the golf course were new, the Wood Sandpiper was still on Gretchen Loch, and at least 35 Ruffs were present. The most interesting seabirds were 12 Sooty Shearwaters, 6 Manx Shearwaters and a Sandwich Tern. A very uneventful day had only a Willow Warbler and 2 Common Whitethroats by way of passerine migrants. A Curlew Sandpiper on the west coast was probably a new migrant, while the Wood Sandpiper was still on Gretchen Loch and 3 Black-tailed Godwits and 31 Ruffs remained on the island. Despite a fairly promising weather forecast for the morning there appeared to be almost no new birds whatsoever. A Grasshopper Warbler and a second Lapland Bunting were the most interesting, and 3 White Wagtails, a Whinchat and a Common Sandpiper were also probably new. A few notable species remained from earlier in the week: the Wryneck was still on the west coast, the Barred Warbler was in Holland House garden, the Wood Sandpiper was on Gretchen Loch and the Little Stint and a Curlew Sandpiper remained near the lighthouse. Other odds and ends included a Red-throated Diver, a Great Northern Diver, a Black-tailed Godwit, a Garden Warbler and 3 Willow Warblers. 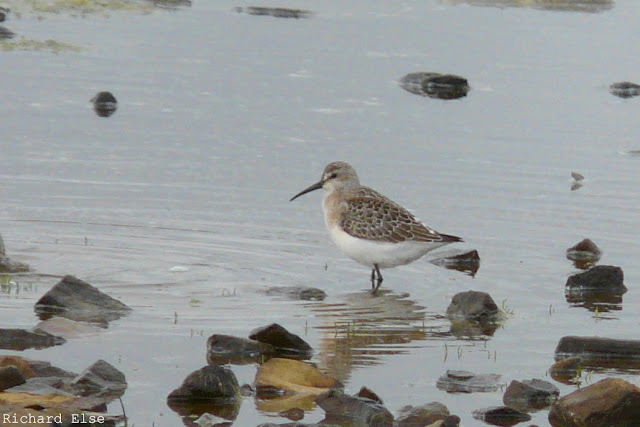 The Curlew Sandpiper is presumably a bird from the flock of 5 earlier in the week. 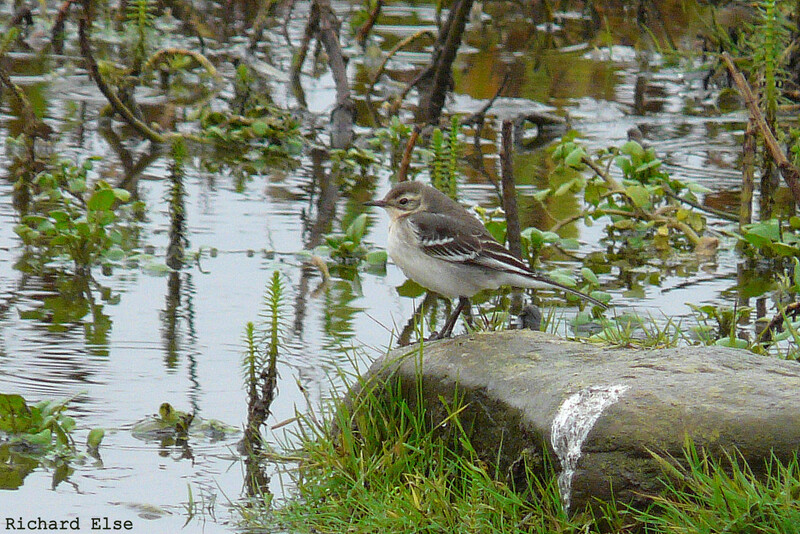 A presumed Citrine Wagtail seen briefly near Garso Loch in the morning provided a bit of excitement at the end of an otherwise very quiet morning census. The observatory staff, setting off to drive to the north end of the island to try and relocate it, made a lucky decision to drop off the recycling at the bottle bank on the way and found the wagtail, now easily confirmed as a Citrine, sat on the pier right in front of them. A new Barred Warbler was seen at Cursetter, while the long-staying ringed bird remained in Holland House garden and the flock of 4 Common Rosefinches remained at Gravity. September, often anticipated as the most exciting month of the birding calendar, began in absolutely pterrific style with a fantastic Fea's Petrel cruising past the seawatching hide at 0800 in the morning. 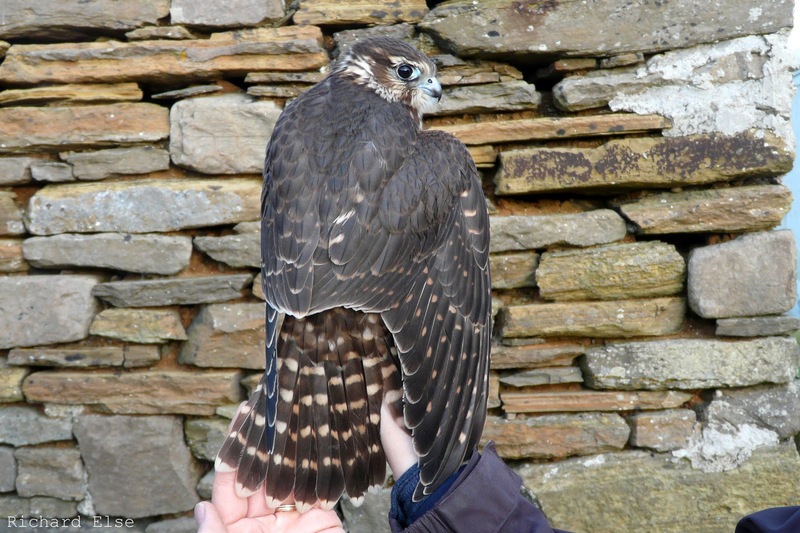 This will be the third record for the island, following birds in September 2002 and October 2010. 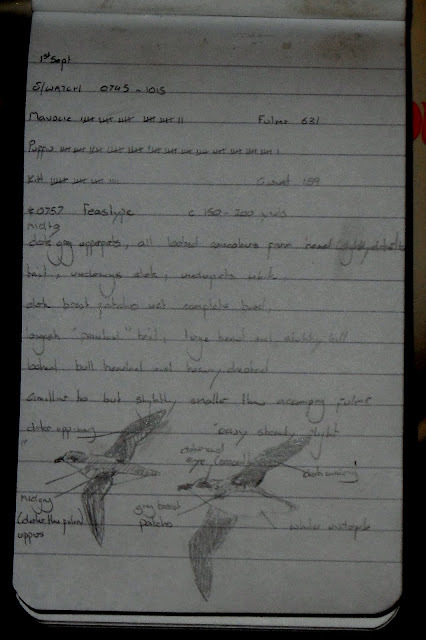 As with most fly-by seabirds, photographs were just not possible, but the field sketches from Paul's incredibly neat notebook amply illustrate the bird's main features. Numbers of commoner seabirds were not as high as the previous day: the totals after 4 hours came to 888 Fulmars, 34 Manx Shearwaters, 22 Sooty Shearwaters, 6 Storm Petrels, 214 Gannets and a Red-throated Diver. The day's scarce migrant landbirds were the same Barred Warbler at Holland House and 5 Common Rosefinches - a flock of 4 at Gravity and a single bird at the school. 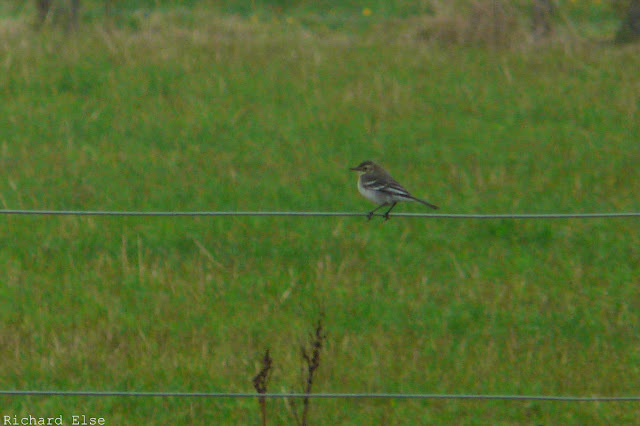 Other passerines included a Pied Flycatcher, 2 Whinchats, 2 Garden Warblers and 6 Willow Warblers. A Kestrel and a new Peregrine were seen, while the remaining Little Stint and 4 Curlew Sandpipers were the best of the waders. Numbers of birds remained quite low, but a few new odds and ends seemed to have arrived and a fair selection of species was seen. The first Marsh Warbler of the autumn near Bridesness was probably the pick of the passerines, although 3 Barred Warblers and 3 Common Rosefinches were also seen. Other small migrants included a Grasshopper Warbler, 10 Willow Warblers, a Garden Warbler, 5 Whinchats and 5 White Wagtails. Nearly 6 hours in the seawatching hide produced an adult Pomarine Skua (a new species for the year), 31 Great Skuas, 1 Arctic Skua, 37 Sooty Shearwaters, 29 Manx Shearwaters, 35 Storm Petrels, 852 Gannets and 1156 Fulmars, one of which was a blue morph bird. A Red-throated Diver and 2 Great Northern Divers flew by, an adult Peregrine was seen, and waders included a Wood Sandpiper, the same 5 Curlew Sandpipers and 27 Ruffs. The day's non-avian highlight was another Basking Shark, this time loitering off the west coast. 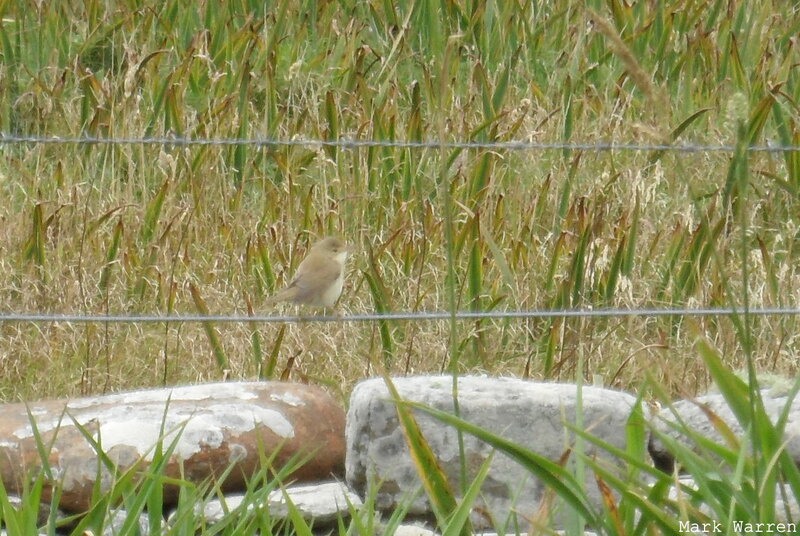 Marsh Warbler is a description species in Orkney, so even the most distant photos are worth getting. 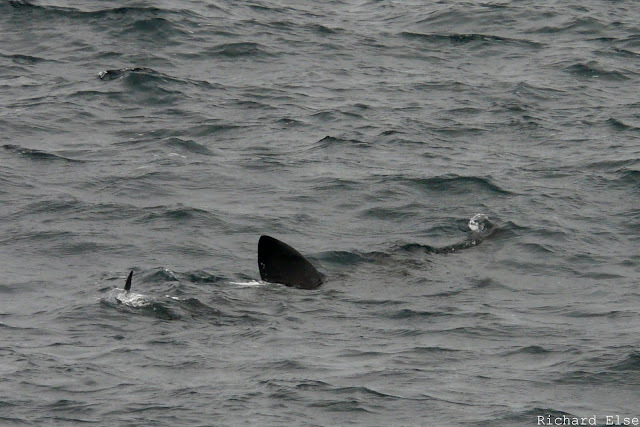 Basking Sharks, the second largest species of fish in the world, are now annual summer visitors to the waters surrounding North Ronaldsay. Today's individual was estimated at a fairly modest 5m in length, but some exceptional specimens have been known to exceed 12m.